ONLY 10 footballers had ever been nominated twice for the NAB AFL Rising Star award before Monday. You can now add Brisbane defender Alex Witherden's name to the exclusive list, with his round nine nomination following his round 17 recognition last year. Among the big names to manage the feat are Luke Power, Nathan Jones, Mark LeCras and Michael Hurley. Exciting Essendon forward Orazio Fantasia was the first player in four years to achieve it when he scored a second nomination in round 17, 2016. Witherden's 24 disposals in the drought-breaking weekend victory over Hawthorn – after the club's 0-8 start – means he has recorded 20 or more in 14 of his 18 career games. "It's obviously a pretty good achievement that I'm pretty proud of," he told AFL.com.au of his nomination. "But it's credit to my teammates for being able to help me out to get that done." The pre-season Rising Star favourite is only eligible because a broken leg suffered playing for Geelong College two years ago, which required further surgery 16 months ago, delayed his Brisbane debut and he only managed nine games last year. 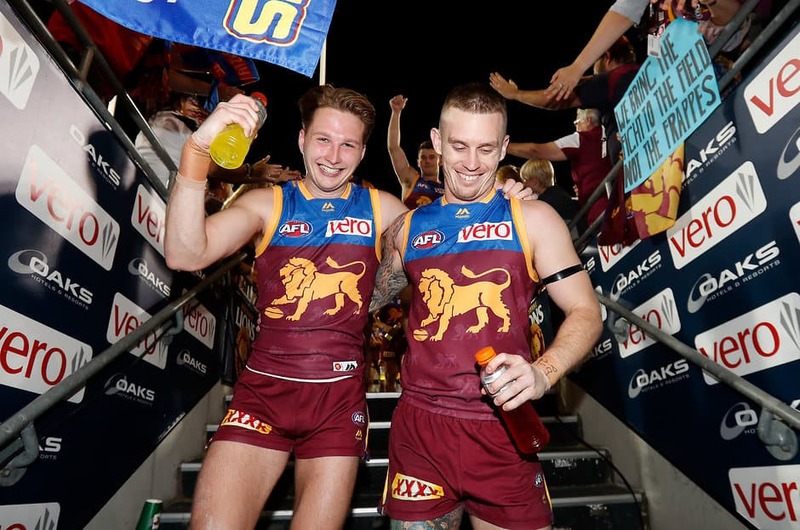 Witherden's coach, Chris Fagan, would be as pleased as anyone, having questioned post Sunday's win the 19-year-old Lion's lack of nomination in 2018. "I didn't actually hear it," Witherden said of Fagan's "pretty extraordinary" comment. "I came into the club today and the boys gave me a bit of stick about it and they said Fages gave me a bit of a pump up after the game, so I might have to go buy him a beer after that." Fagan will just be content knowing Witherden has already re-committed to the Brisbane cause through the 2020 season. The teenager is not only a bright football talent, but also a breath of fresh air in the way he speaks publicly and with his openness in coveting a leadership role. He even cheekily pointed out on social media at the weekend an umpire making contact to St Kilda defender Nathan Brown, which was timely after the events during the week. Witherden inherited an ideal role model when ex-Hawk Luke Hodge changed his mind on retirement and elected to continue his career at the Lions. "Hodgey's always demanding high standards, whether it be at training, in the gym or watching vision – and he always challenges you to be better," he said of the four-time premiership star. "If we don't execute a drill as it should be done at training; at the end of training he'll call us in as a defenders' group and say, 'We're doing it again and we'll do it until it's right'. "He's really thorough and watches hours and hours of vision each week and the boys call him a bit of a footy nerd – that's what he is – but he's so competitive and passionate. "He invests everything he's got into it and that professionalism is starting to rub off on the rest of us. I couldn't speak more highly of him." RISING STAR Who's in the running so far this season? Witherden is surrounded by promising young players at the Gabba, with Hugh McCluggage, Harris Andrews, Eric Hipwood, Jarrod Berry, Cam Rayner and Zac Bailey just a few of those. He raves about McCluggage's work-rate – noting one example in the Gold Coast game where the 2016 No.3 pick had three touches in one passage of play – and how Rayner is a "big bull". More importantly, Witherden believes in the direction Brisbane is headed under Fagan and saw progression in spite of the losing record to start the season. "We were sick of honourable losses, as put by others, and we were really hunting that win," he said. "We thought we were in probably six or seven of the first eight games we played – all bar that Richmond game – so just to get that win at the weekend shows we can do it. "What we're trying to achieve does work if we execute it properly and that just gives us confidence that if we trust our method and execute the plan then we'll be right."